In a major jolt to India's solar energy programme, the Rajasthan government might cancel the 4,000-Mw solar UMPP (ultra mega power project), which was expected to come up near Sambhar Lake. The state government has cited reasons of ecological and environmental impact that could take place if the plant is established at this site. The Vasundhara Raje government has written to the Centre that the area under consideration is a prime site for migratory birds that would perish if a power plant or transmission line is raised there, sources said. However, persons close to the issue said there were political reasons as well, as the project was one of the milestones of the UPA-II (United Progressive Alliance-II) government. The Bharatiya Janata Party-ruled state government is uninterested in going ahead with it. 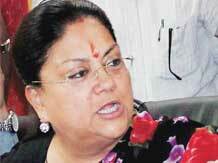 Rather the chief minister is looking at designing a separate solar power programme for the state. The project aimed at a massive scaling up of solar power was launched in September last year, which was supposed to be set up and run by a joint venture of public sector units - Bharat Heavy Electricals Ltd, Power Grid Corporation of India, Solar Energy Corporation of India, Hindustan Salts Limited and Rajasthan Electronics and Instruments Limited. The estimated cost of the project was calculated at Rs 7,500 crore. The land in question, approximately 23,000 acres, is around Sambhar Lake, which under the global Ramsar Convention is also listed as an ecologically sensitive area. The state government is using this argument almost a year after the memorandum of understanding was signed between the PSUs. "The area that is ecologically sensitive is only 5,000 acres, which was avoided in the planning. The rest is very clear land and it is strange the state government has raised this issue now," said a senior official of Union ministry of new and renewable energy (MNRE). Around 18,000 acres were to be provided by Hindustan Salts as its equity in the project. The ministry is involved in this project through its subsidiary, Solar Energy Corporation of India, and is now looking for new land for this project. Rajasthan currently has a capacity of 666 Mw of solar power, second highest in the country after Gujarat. Its mission statement aims to add 4,000 Mw by the year-end. "The government in the Union Budget this year announced setting up of four solar UMPPs across the country, including one in Rajasthan. The state was the first to announce a solar UMPP, that too of such a huge capacity. We would have to find a new land for executing this project," said the MNRE official. The Union Budget has put a lot emphasis on scaling up of clean energy, including setting up of large-scale power plants of plus-500 Mw. Piyush Goyal, minister for coal, power and renewable energy, also pushed for expediting work on solar power projects and have on paper at least a capacity of 5,000-6,000 Mw in several states by the month-end.